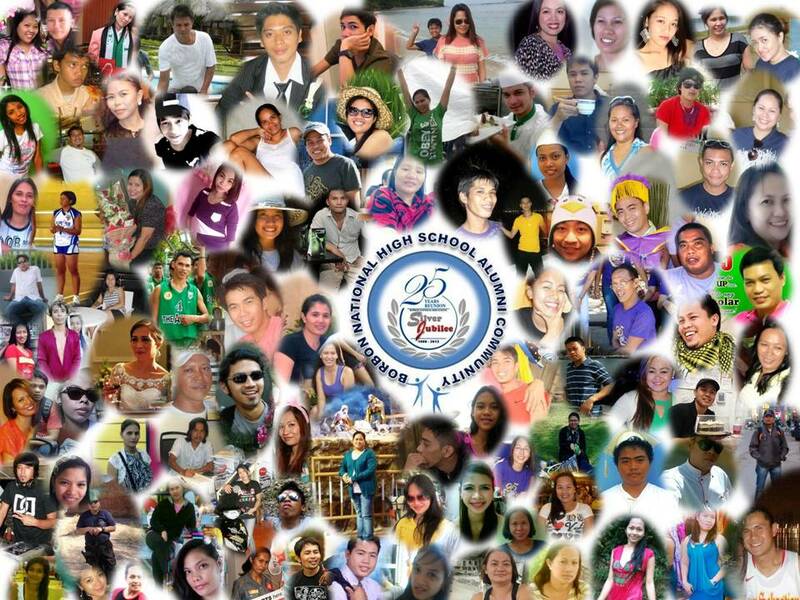 BNHS alumni are bound to pass through a real life journey after completing high school. Some chose to travel the narrow road but less taken while others pass through a wide thoroughfare where most people pondered upon. But none really knows where those roads will lead or whatever end it brings. What is certain though is that all of us will definitely learn to discover our own strengths and weaknesses as we traverse the road we’ve chosen. Then learn to realize that life is not at all— a bed of roses. Twenty five years after the establishment of our school, some have already travelled far while others may have yet to start their own life’s journey. And whatever life has introduced you into, I am pretty sure that it is all worth to share. After getting in touch with different alumni population in facebook and having learned some of their professions and occupations, I am so privileged to see some of them thriving. Few even shared brief account of their admirable journey. Maybe one day we’ll share some of their commendable life journey here in our blog site. It’s a good topic to induce so others can emulate or at least learn something from their stories. But wait… what is important to note is that whatever profession or occupation each alumna/ alumnus had chosen,we should not discount the fact that all professions (whatever it is), have had essential bearing in the community we live in and contributions that each will impart to that certain community are surely indispensable. 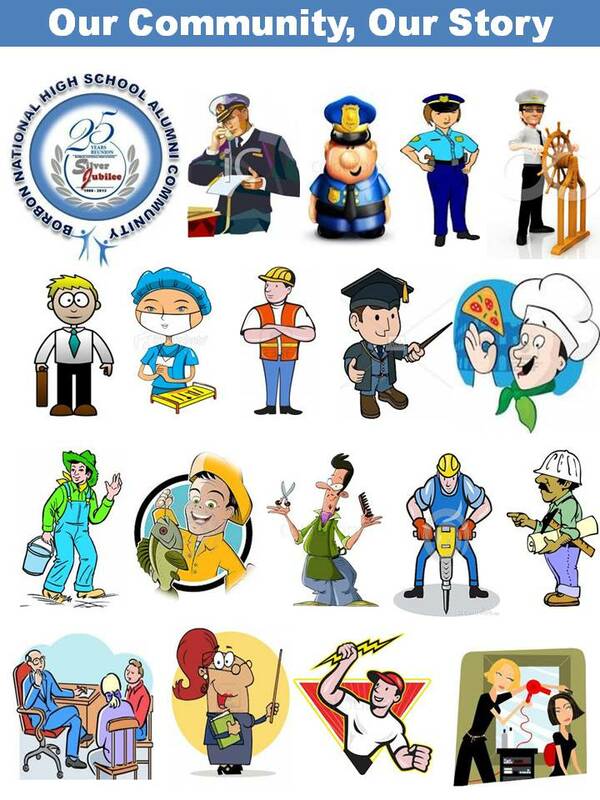 We have a list of different professions below and a simple explanation of what each person does in that profession. Accountant – a person that works with the money and accounts of a company. Architect – a person that designs building and houses. Author – They write books or novels. Baker – They make bread and cakes and normally work in a bakery. Bricklayer – a person that helps to build houses using bricks. Bus driver – a person that drives buses. Butcher – a person that works with meat. They cut the meat and sell it in their shop. Carpenter – a person that makes things from wood including houses and furniture. Chef/Cook – a person that prepared food for others, often in a restaurant or café. Dentist – a person that can fix problems you have with your teeth. Designer – a person who has the job of designing things. Doctor – a person you go to see when you are ill or have some type of health problem. Dustman/Refuse collector – a person that collects trash/rubbish from bins in the street. Electrician – a person that works with electric circuits. Factory worker – a person that works in a factory. Farmer – a person that works on a farm, usually with animals. Fireman/Fire fighter – a person that puts out fires. Florist – a person that works with flowers. Gardener – a person that keeps gardens clean and tidy. They take care of the plants in the garden. Hairdresser – they cut your hair or give it a new style. Housewife – they take care of children and keep the house clean and order. Journalist – a person that makes new reports in writing or through television. Judge – a qualified person that decides cases in a law court. Lawyer – a person that defends people in court and gives legal advice. Lecturer – a person that gives lectures, usually in a university. Librarian – a person that works in a library. Lifeguard – a person that saves lives where people swim (at a beach or swimming pool). Mechanic – a person that repairs machines, especially car motors. Model – a (usually attractive) person that works in fashion, modeling clothes and accessories. Newsreader – a person that reads the news, normally on television. Nurse – a person trained to help a doctor look after the sick or injured. Optician – a person that checks your eyes and try and correct any problems with your sight. Painter – a person that paints pictures or the interior and exterior of buildings. Pharmacist – a qualified person that works with and dispenses medicine. Photographer – a person that takes photos. Pilot – a person who flies a plane. Plumber – a person that repairs your water systems or pipes. Politician – a person who works in politics. Policeman/Policewoman – a member of the police force. They (try and) prevent crime. Postman – a person that delivers mail to your house. Real estate agent – a person that makes money from selling land for development. Receptionist – a person that is at the reception (entrance) of a company. Scientist – a person that works in the science industry. They do many experiments. Secretary – a person employed in an office who types letters, keeps records etc. Shop assistant – a person that works in a shop or store selling products. Soldier – a person who works for the army. Tailor – a person that makes clothes for others, many times producing exclusive items of clothing. Taxi driver – a person who drives a taxi. Teacher – a person that passes knowledge to students, usually at school. Translator – a person that translates from one language to another. Traffic warden – a person that patrols areas to check that people do not park in the wrong place. Travel agent – a person that organises and sells holidays and flights for others. Veterinary doctor (Vet) – a qualified person that looks after sick animals. Waiter/Waitress – a person that works in a food outlet, looking after customers and serving food. Window cleaner – a person that cleans windows, normally the windows of big buildings. Still more occupations are not listed here. If you know one, tell us. This is our community and our story. 44,026 visitors to BNHS Alumni Blog Site. Thanks. Get in touch with the rest of our alumni community. READ & ENJOY THIS SITE!